Often, tooth replacement solutions, such as dentures or bridges, rely on crowns or suction to hold them in place. While they do help address tooth loss, they don’t stop the loss of jawbone density and often require adjustment or replacement every five to ten years. Fortunately, we can offer an alternative: dental implants. They offer a number of benefits over other traditional tooth replacement options. Avoid Facial Collapse: When we lose teeth, the body registers the loss of the tooth roots. In response, the body stops supplying the surrounding jawbone with doses of calcium and phosphorus, allowing the bone tissue to dissolve. Over time, this can lead to an older appearance due to facial collapse. 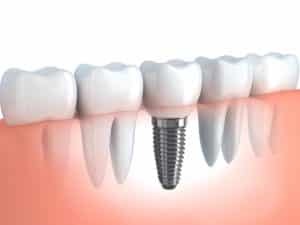 However, dental implants are recognized by the body as natural tooth roots, stimulating the growth of jawbone tissue and protecting your smile. Eat a Greater Variety of Food: When you lose several teeth you may find yourself subsisting mainly on soft foods. This deprives your body of essential nutrients, hurting your overall health. However, replacement teeth allow you to eat as you did prior to losing your teeth. Speak More Clearly: Often, tooth loss makes communicating clearly difficult. Replacing your lost teeth can help people better understand you. Enjoy Longer Lasting Tooth Replacement: Did you know that with proper care and maintenance your dental implant can potentially last a lifetime? Other prosthetics typically require periodic replacement every few years. However, dental implants act like natural teeth and as a result, can potentially last for decades. If you have any questions about replacing missing teeth, then please contact our office.